A core tenet of the scientific method lies in using reproducible empirical evidence to validate or fail to validate a hypothesis. Because God created the heavens and the earth, he lies outside the created order, where evidence might be found. Therefore, scientific testing of the existence of God is impossible. However, the created order can be used to draw inferences about God, much like we might observe fingerprints of a potter on the pottery. 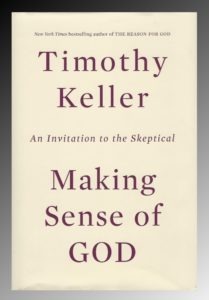 In part three of his recent book, Making Sense of God, Timothy Keller summarizes six arguments for the existence of God from: 1. existence, 2. fine tuning, 3. moral realism, 4. consciousness, 5. reason, and 6. beauty (217). These bear repeating. Given such a small probability that the laws of physics were randomly aligned in this way, many scientists have concluded that it is not an accident; it was intentionally planned this way. It is kind of like finding a working clock on the beach and assuming that it was randomly constructed—no reasonable person would assume that, but would rather assume that a clockmaker had to exist. Even an argent atheist would not idly stand by and watch another person drown or be killed in a burning house when something could be done to aid them in surviving. This kind of moral obligation is something that virtually everyone feels, yet is counter-intuitive from the perspective of personal survival—water rescues and running into burning buildings routinely kill rescuers, even those trained and equipped like lifeguards and firefighters. Why do we feel obligated to put ourselves at such risk? Christians answer that God created us with a moral compass. Keller reports that has been popular in recent years to argue that our reasoning and appreciation of beauty both developed from the process of natural selection because they helped our ancestors to survive. Evolutionary psychologists have gone a step further arguing that even our faith in God is a product of evolution and natural selection because it helped our ancestors to survive. The problem exists, however, that many animals seem to have survived just fine without developing any capacity to reason at all. Furthermore, if our faith is a product of natural selection, why wouldn’t we trust our reasoning capacity to tell us the truth? (225). The arguments for beauty parallel those for reason. Keller, citing Luc Ferry, writes: “truth, beauty, justice, and love … whatever the materialists say, remain fundamentally transcendent.” (226) In other words, they all point to the existence of a loving God. Philosophers remind us that God transcends our universe being removed from it having created it—God stands outside time and space, as we know it. He is also removed from us by virtue of being holy—sacred and set apart. God’s transcendence makes it impossible for us to approach God on our own; he must initiate any contact that we have with him. Christians believe that God revealed himself to us in the person of Jesus Christ. Why is it that Christianity continues to grow in spite of strong influence of secularism in the West and obvious persecution of Christians outside the West? For me, the answer lies in God’s continuing and loving presence in each of our lives. What about you? My brief overview of the third part of Timothy Keller’s book, Making Sense of God, does not do it justice. Keller’s book is a jewel. It answers better than most books focused on apologetics some of the basic concerns of our age.